PEBBLE BEACH - When he tees off Thursday morning at 8:10 PDT in the second round of match play at the 118th U.S. Amateur, Jackson Van Paris will attempt to accomplish something that only Bobby Jones is believed to have done. And that was more than 100 years ago. Van Paris is a precocious, wafer-thin 14-year-old from Pinehurst, N.C. His mother, Jana, says that Jackson has yet to grow into his very large feet, even though he is almost 6-foot-2. Already he has committed to play college golf at Vanderbilt, and his brown cap displayed the familiar "V" in the center of a star that represents the Vandy logo. He makes a pronounced sway into his downswing, which gives him some necessary power without diminishing his accuracy. 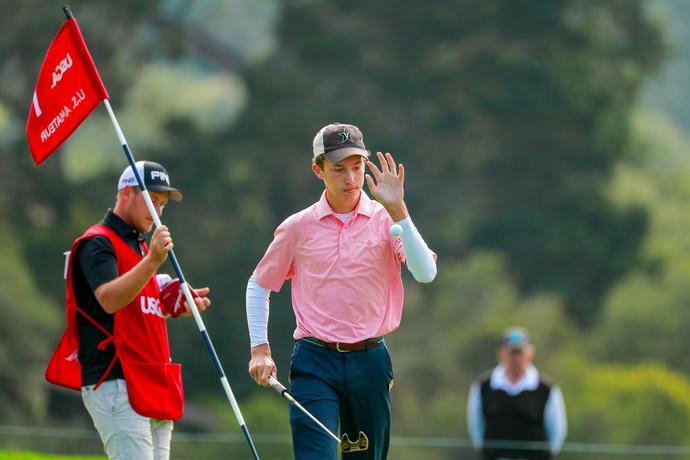 He doesn't seem to be nervous, even though he admitted feeling jittery coming down the stretch in his first-round match at Pebble Beach Golf Links against Dylan Perry of Australia. And then all he did on the iconic par-5 18th is chip in for a birdie for a 1-up victory. As far as anyone could tell, Van Paris is the second-youngest contestant to win a match in the U.S. Amateur, trailing only Jones, who made his debut in the 1916 championship at Merion. Jones was 14 years, 5 months and 19 days when he defeated 1906 champion Eben Byers in the first round. Jones reached the quarterfinals before losing to Robert Gardner, the defending champion, but he would go on to win nine USGA titles, including five U.S. Amateur crowns. Van Paris, who turns 15 in exactly one week, is the youngest to win a match since the match-play bracket was expanded to 64 players. And he did it with a seeming calm that belied his youth. After blowing a 2-up lead, he gathered himself for a critical shot just off the back-left side of the 18th green and executed a tidy 54-degree wedge perfectly, nipping the ball off the turf and holing out from 20 feet. When his ball caught the right edge and settled in the cup, he pumped his fist in elation. "It's pretty incredible," said the youngster, who carried his own bag for 36 holes of stroke-play qualifying and for Wednesday's match against Perry, 23, runner-up at the 2017 British Amateur. "To win a match and to play well out here is crazy because I know how many great players there have been before me." Van Paris' opponent in the round of 32 is Mason Overstreet of Kingfisher, Okla., who advanced with a 1-up decision over Cameron Sisk of El Cajon, Calif. Though he never trailed in the match, Van Paris had to weather a difficult stretch on a brilliant sunny and crisp day on the Monterey Peninsula. After winning the 11th and 12th holes, the first with a 10-foot birdie putt and the second with a par, he lost the next two. He bogeyed the 13th after a poor driven-"Maybe the worst drive of my life," he said of the 230-yard bunt-and then he had to concede the par-5 14th when he pushed his 2-iron second shot right and found that his ball caromed off a tree and out of bounds. "Kind of a bad break, but I didn't deserve much better after that shot," Van Paris said. "I was not happy there. Gave two back after I got 2 up, and we tied the first 10 holes of the day, so I kind of feel like I didn't gain much ground." RELATED: How great would it be to win the U.S. Amateur at Pebble Beach? He erased all those feelings, and the nerves that caused him to strike too boldly his 105-yard approach to the green at Pebble's home hole, with one final magical shot. When Perry missed a tying 12-foot putt, Van Paris celebrated a victory he'd been dreaming about since he navigated the 36-hole qualifier, in which he posted three-over 146, making him the 48th seed. "He's always been special. He's always had a knack for the moment," Todd Van Paris, Jackson's father, said of the youngest of his three children. "I told his mom, 'He just needs to do something special here.' When I saw him take the flagstick out of the hole, I said, 'OK, here we go. He wants to chip this in.' And, obviously, that's what he did. What a way to finish." Should he triumph today, Van Paris would match Jones' win total from 1916. Two wins put Jones into the quarterfinals because of the 32-man match-play setup at the time. Van Paris needs three wins to reach that stage (the Round of 16 is played Thursday afternoon). If he succeeds, then he'll nudge aside, at least in one distinction, the greatest amateur in golf history.